With first place in the weakened NFC East on the line, the Washington Redskins are hoping to be completely healthy when they take on the New York Giants at FedEx Field. Alfred Morris (rib): full in practice during the week (PROBABLE) after a reaggravation of the injury initially suffered against the Saints resulted in Morris playing just three offensive snaps against the Panthers. Keenan Robinson (shoulder): limited during practice the entire week (QUESTIONABLE) after missing the past two games at middle linebacker with a wear and tear shoulder injury. Jordan Reed (knee): full in the entire week’s practice (PROBABLE) after suffering a MCL sprain against the Panthers that he was able to return from. Trent Williams (knee): although only getting a limited amount of work on Thursday and Friday, the Silver Back is PROBABLE with a left patella contusion. Jay Gruden is “hopeful” that Williams will be able to go because he is the one guy on the team he knows can play through an injury. The Pro Bowl left tackle said he “definitely” will play against the Giants. DaShon Goldson (knee/wrist/hamstring): limited throughout the week (PROBABLE) after playing last week with no reason to believe in a reaggravation of his injuries. Jason Hatcher (rest/knee): DNP on Wednesday, limited on Thursday, and full on Friday (PROBABLE) to continue his recent practice routine of being rested early in the week. Chris Culliver (shoulder/knee): placed on injured reserve (OUT) on Friday after “tweaking” his knee, which resulted in a torn ACL and MCL. Trenton Robinson (hamstring): DNP during the week and will be OUT for the second straight game after missing the previous game against Carolina. DeShazor Everett (hamstring): DNP on Wednesday and limited on Thursday and Friday (QUESTIONABLE) after getting hurt on a special teams play when the corner was running down field as a gunner. Jeron Johnson (illness): returned to participate fully on Friday after not taking part on Thursday (PROBABLE), but the Redskins will likely have their penciled in starting strong safety available on Sunday. Bashaud Breeland (hamstring/illness): DNP on Friday with an illness resulting in a QUESTIONABLE status for Sunday’s game against the Giants. 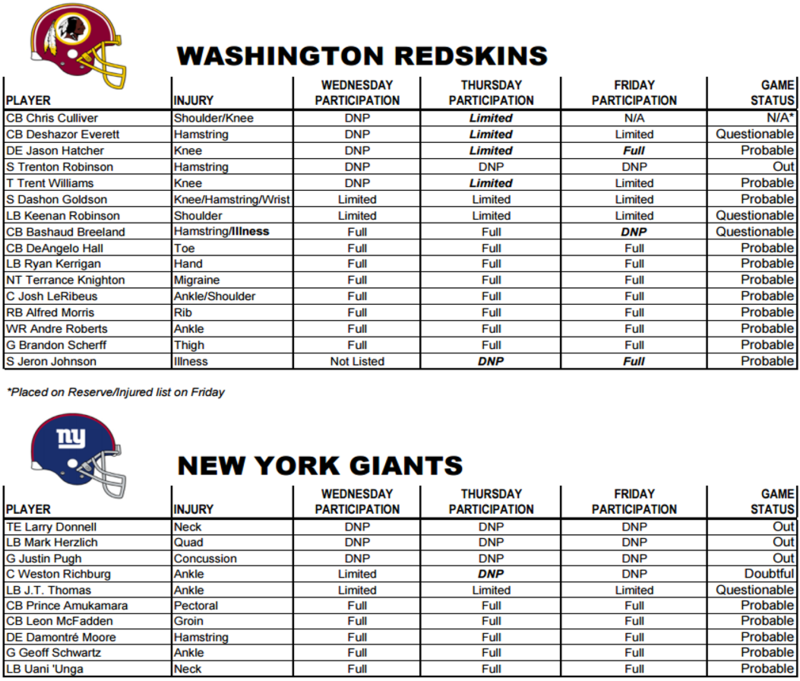 DeAngelo Hall (toe), Ryan Kerrigan (hand), Terrance Knighton (migraine), Josh LeRibeus (ankle/shoulder), Andre Roberts (ankle), and Brandon Scherff (thigh) were all full participants in practice during the week and PROBABLE for the Giants game. For a little bit of enemy intel, the Giants will be without their pass catching tight end Larry Donnell, who previously burned the Redskins last year, along with two of their starting interior linemen, G Justin Pugh and C Weston Richburg (doubtful). This post will be updated up until kickoff on Sunday afternoon against the New York Giants.